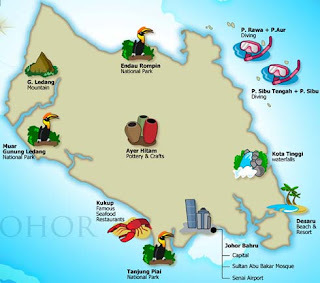 Geography: Johor new tourist destinations. Look at how Johor is developing its tourist industry. Other than the newly opened Legoland and the imminent Hello Kitty Theme park, plan is undergoing in the building of an integrated resort at Desaru in Johor with 2 theme parks and 2 golf course. Accessibility - proximity to Singapaore and Senai airport 45 mins away will attract more local and regional visitors which at is presently at 10 million in 2012.The project is expected to create 3500 jobs. Refer to the map above - other than the newly opened legoland and Hello Kitty theme park, name some of the tourist attractions found in Johor. Why do you think the east coast of Johor offers more water sports related activities? 1 Response to "Johor new tourist destinations."